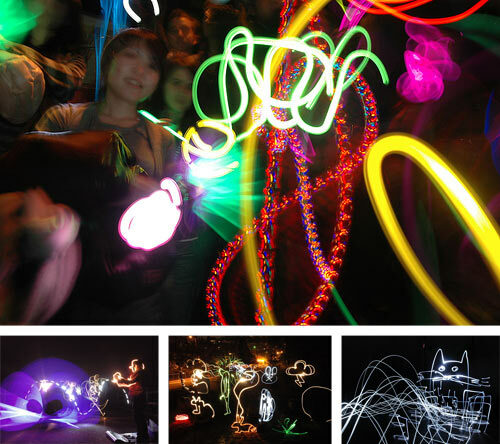 NewTown presents PIKA PIKA, simultaneously a family-friendly, low-tech light-animation workshop and large-scale screening event. Just bring your sense of fun and wonder. The creators of this exciting new art form, Japanese artists Kazuo Monno and Takeshi Nagata, or TOCHKA, will provide simple LED flashlights and demonstrate how to use them to magically paint colorful light “graffiti.” The techniques are easily learned and within a few short minutes, participants will view the animated results projected on the jumbo screen in the courtyard. TOCHKA’s goal is to bring joy and inspire people to work together across cultural, ethnic and linguistic differences. They have received numerous awards and have traveled the world presenting workshops and screening their work. Utilizing public video sites such as YouTube, TOCHKA has launched countless PiKA PiKA animations, propelling this accessible, low-tech animation technique into a DIY global phenomenon. PiKA PiKA is sponsored by The City of Pasadena Cultural Affairs Division and One Colorado.